The ZeusLog family products are developed in our laboratories using state of the art technologies to ensure reliability and performance to stand out from other products on the market. Our products and systems are perfectly adapted to the specific requirements of various sectors. They are geared to ease of use and ease of management (both for distributors than the parts department) and are designed to have the highest quality, functionality and usability. Our continuous investments in research and development, make that all people involved on processes of ideation, design and manufacture a new product are constantly stimulated in the search for innovative solutions that combine performance and design with electronics needs, reserving specific attention to the very small size and energy consumption with a view to saving energy. 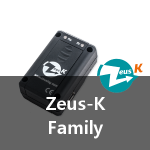 The Zeus-K family products are born with the idea of being able to monitor, in a simple way, the energy of an electric profile. 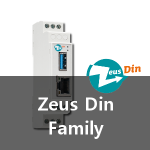 The Zeus Din family products are born with the idea to combine the ease of installation and ease of use with the professional needs of an installer of electrical installations. The Zeus Link family products are born with the idea of making simple and immediate communication between devices installed inside electrical panels and the surrounding world.